Buy our email database of Portuguese contacts today and find qualified data on the sales leads you need. With Bookyourdata.com, you can reach locals in Portugal and start marketing your product or service across the border easily. Say "olá" to business professionals there in minutes! Whether you want to network with executives in Lisbon over the phone, show your portfolio through email to professionals in Porto, or send mailings to direct addresses in Amadora, this is the business database that would be the best tool for reaching out. 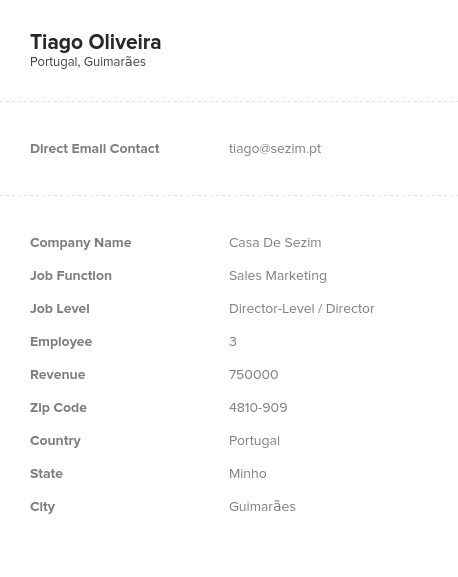 It's a pre-built Portugal email list, pulled by country, and contains all of the quality, human-verified data you'd need to connect: accurate Portuguese email addresses, postal addresses, real names, numbers, and more. When you're trying to build B2B relationships overseas or across borders, start with the right information. Buy this Portugal mailing list, download it within minutes as a useful .CSV file, plug it into your CRM, and then start using its leads to email, call, or send mail to Portuguese professionals. This is one of our pre-made business contact lists, but note that you can customize your Portugal business list further with our custom list-builder tool. Try it, or simply buy this versatile product as is if you want to have a solution that can be useful for multiple types of B2B marketing campaigns in Portugal. Bookyourdata.com is where to buy email lists partly because of this flexibility, but it's also because of affordability and accuracy. See how well a targeted, local email address list will work for your campaign today!